Busy B Family: What is yours? Okay, so when I was a little girl, my favorite toy was my little baby doll. 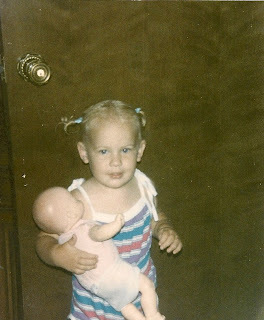 She had a cute wrinkly nose, plastic arms & legs and a soft cotton-ey midsection. I loved that baby more than anything. Not to mention she fit into some of my old clothes from when I was a baby. For some odd reason (which none of us can remember) I colored on my baby doll with an ink pen; in her ears, on her arms and even in her little nostrils. But she was still perfect to me. Okay, this is where it gets bad, so prepare yourself. I got my precious baby doll from Santa. And my dad, being the funny man that he is, made the comment that "she looked like Santa dropped her on the ground and the reindeer stepped on her face." This is how my baby came to be known as "Ugly Baby." That's right, Ugly Baby. Now, obviously my older brother (who must've got his funny gene's from my dad) thought this was hilarious. When we would be in the car, they would roll down the window, grab "ugly baby," stick her head out of the window and then roll it up so she was hanging out of it. When my brother got remote control trucks for Christmas or his birthday, they would lay my baby on the ground and proceed to use her as a jump. One time even leaving a tire mark across her poor little face. Bless her little heart, I would cry and cry when they would call her ugly baby. Regarless of how she looked to them, she was a beauty! 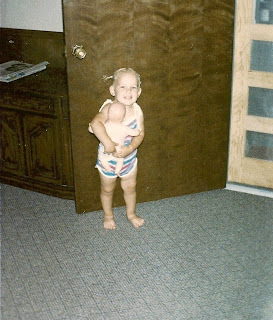 I always told my parents that because of this horrible injustice as a child, I would grow up and have to be in therapy and I would have to tell them all about "ugly baby" and how they would make fun of her and abuse her. I still have ugly baby and to this day, she is still referred to as such. She still has pen mark all over her, seeing as how we never could get it off. And I still get teary eyed when they hash out the details of their cahoots on her. And I still feel the pain I did as a little girl for that precious baby doll. Someday a therapist is gonna make a lot of money off of me, huh?! Question is.... What is or was your favorite childhood toy? Do you still have it? And do you have any good stories to go along with it? Good post! I remember 'ugly baby!' Do you remember 'baby Tori?' I got her about the same time you were born so I named her after you!